The piece is pretty straightforward but it will take a little while to get used to the left-hand stretches and to build up enough stamina. The first thing you need to do is to get your hand in a good starting position. Ideally it should look something like that in the illustration above. Try to get it so that it feels comfortable as it’s going to be kept in a similar position throughout the piece. The first bar of the tune goes between the starting position and (for arguments’ sake) position 2 (see picture 1). Use only downstrokes throughout and try for a little palm muting as well to keep it sounding tight. The right hand should look something like this (see picture 2). These left-hand stretches may feel a bit alien, but the problems usually start in bar 2 with the little finger doing a five-fret stretch! If you have problems making this reach then check the left-hand thumb position. It should be behind the second finger near the centre of the neck – this helps the hand to ‘open out’ and should make it feel a little more comfortable. I have pretty small hands so there are really no excuses! (see picture 3). At the end of bar 4 the left hand changes onto the A and D strings but still uses the same physical shapes found in the first four bars. This obviously means that you now use downstrokes only on the A and D strings, so try to avoid hitting the low E string. In case you do, though, you may want to try out this muting technique as an added precaution: when I move my left hand onto the A and D strings I keep the side of the first finger resting against the low E string so that if I do accidentally hit it all I’ll hear is a muted thump. Now in this key the low E is okay, but I’m telling you this in case you ever try it in a different key (see picture 4). 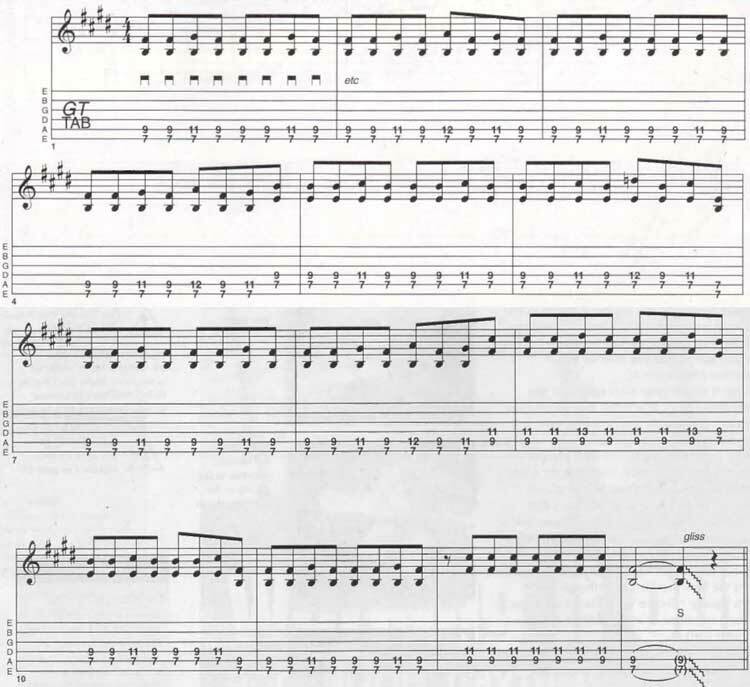 For bar 9 all the same rules apply, but this time two frets higher. You’ll find that keeping the hand in this position for protracted periods usually makes your wrist ache quite a bit, especially around the back, so a little practice daily is infinitely better than blitzing it for a few hours and straining something. In fact it’s no wonder that players such as Status Quo’s Rick Parfit favour a drop D tuning, which means that our ‘1st position’ shape can be played with only one finger. As an extra added bonus also included the bass line for you, although you’ll find this equally effective when played on guitar (either as a substitute or as an addition to our main guitar part). 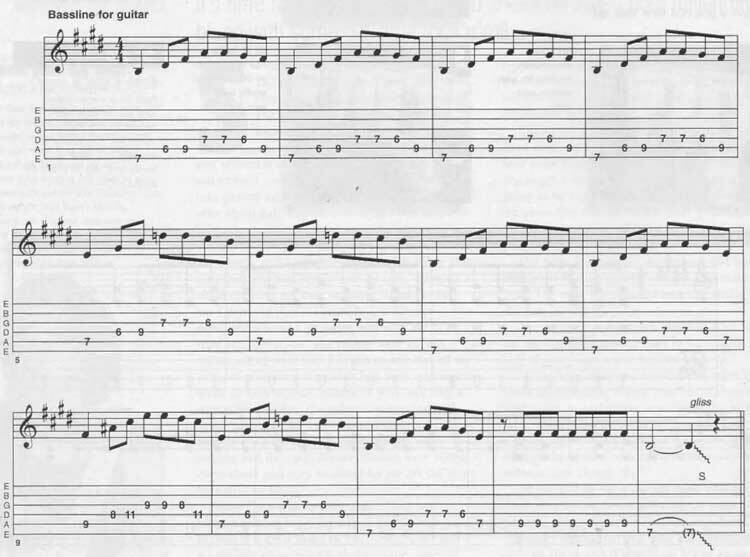 This lesson includes Rock N Roll Guitar tab and sheet music. For bar 9 simply move your left hand up two frets – it’s as simple as that! It’s a full lesson of Rock N Roll Guitar Rhythms. © 2012 - 2019 TabsClub Powered by TabsClub 42 queries in 0.373 seconds.